This year, I wanted to focus more on sharing the stories of the amazing families I photograph. I asked Vanessa to share her beautiful birth story with us. Her story touched me deeply, to say that I am blessed to have her in my life not only as a client but now as a friend is a bit of an understatement. This woman was diagnosed with Multiple Sclerosis, the way she loves and lives is truly inspiring. I hope you enjoy her precious story. A couple weeks ago one of the sweetest babies came in to visit me in the studio. Sweet Baby Easton was my first baby of 2017 and he knocked his session out of the park. At four weeks old this sweet little bub did amazing at his newborn session. His parents were excited for their session in my studio. I love seeing the new bond between first-time parents. Their excitement over their newest addition, how they fascinated by their baby's tiny features and my favorite is how parents still sit in awe over how that tiny human was something that they made. The gift of life is amazing. Easton had his mom and dad wrapped around his little finger. I used lots of warm tones in Easton's session, his parent's decorated their house using warm neutrals. Easton's nursery had one of the most fun and creative themes I have heard to date. His nursery is monsters. At Easton's reveal session I was able to see his room up close and personal and I have to say it is one of the cutest nurseries I have ever seen. Monsters would seem like something so scary but these are his mom's own creation (think Monster's Inc. adorable) The splashes orange, green and blue really bring this room together. Congrats again Kinsey and Brian! Easton is perfect! My first milestone session of 2017 was to celebrate Lincoln's first birthday. I can not believe how much this baby boy has grown! One year ago I was blessed to be there to witness this baby boy come into the world. His parent's waited anxiously for his arrival, the day Lincoln was adopted their dreams came true. They finally had a sweet baby to call their own. Lincoln's aunt gifted Lincoln's mom and dad with a hospital and newborn session. I remember the first time I saw this new family together, they were so incredibly happy. I had never seen two people so excited to change a poopy diaper! A week after Lincoln was born I was able to snuggle him in the studio. Lincoln's nursery is a woodland theme. I found a fox stuffy just for the occasion. Lincoln was a dream to photograph, he slept, he ate, he smiled and took photos like a champ. At three months Lincoln came back into the studio. What a change to see! Those smiles melted my heart. His eyes were wide with wonder and he was so curious! We used the same fox from his newborn session to show how much Lincoln had grown. One of my favorite images from last year was from his three-month milestone session. His eyes get me every time. At Lincoln's six months session this chubby little boy was even more, smiley and sitting up completely by himself. He loved finding his toes and everything went into his mouth. This drooling chubster had me smitten. I always looked forward to seeing him every three months. I loved watching him grow. At his nine month session, his mom brought her baby doll cradle for him to sit in. We went from sitting to standing in what seemed to be a blink of an eye. We did lots of singing at this session, Lincoln loves the song "Bicycle Built for Two" and finds it hilarious when you sing it off-key. The fox looked so small in his hands. Of course, it went into his mouth. He was cutting teeth and teething on everything he could grab his hands on. For Lincoln's first birthday his mom and I had chatted about doing a woodland themed session. A set up simple and neutral but also highlighting the cozy outdoors. And of course, we had to use "The Fox", which now looked incredibly small next to this toddler! What a better time for a camping set up?! Lincoln's mom brought in her grandpa's fly fishing basket and her grandma's little red chair. I love how she always thought to incorporate family heirlooms into sessions.It always added that special personal touch. For this session, we did a cake smash and a bubble bath afterward. These are some of my favorite photos of Lincoln to date. I haven't seen a baby this happy about water in my life. My studio looked a tsunami came and went. Messy but it was so worth it. Happy Birthday sweet boy! It was an honor and privilege to witness you grow. The first time I met the G family it was in a crowded coffee shop. I usually meet with just mom, but this meeting was different. Dad and two big sisters were there along with mom. It was wonderful to meet the whole family! One of the first things Mom said to me was, “Just so you know, when my water breaks, my babies come extremely fast.” KEEP THIS IN MIND. Take note, this is also her third baby…. Early one night in mid-September I got a text from Jen saying that she was going to the hospital for strong contractions. I loaded up my gear and waited for the go. I was so worried I would miss the whole thing. I finally got the ok to come down. When I got to the hospital she was 80% effaced and 5cm dilated with a bulging bag. In birth world talk, she was halfway to having a baby. We walked the halls, did stretches, breathed through contractions. When I say “we”, I really mean Jen with the help of her husband. After all of that, they decided to send Jen home because she was 37 weeks and 3 days and stalled at 5cm. You are probably thinking WHY? WHY? WHY? Mercy Gilbert was in near-completion of their Baby Friendly Certification. Basically what that means is birth professionals can not help patients progress with labor until they are at least 39 weeks. To say we were all frustrated would be a bit of an understatement. Jen and I became fast friends over the course of her pregnancy and would quite often stay up until 2 am chatting with each other on Facebook. Two nights later while on my way home I received a phone call at 8:30 pm from her. I still to this day do not know how I shaved 15 minutes off of a normal 45-minute drive, but it happened. Jen and I walked the halls for a while, and even took a selfie! After much walking, we all took a nap for a bit. Then Jen got in the tub for a short minute. (Literally) When she got out of the tub you could tell the baby had made it’s way to the birth canal. At this point, Jen wanted an epidural. But she wouldn't be able to get one! The nurse comes in to check and there is Maddy’s head. The nurse runs to the hall and screams for a doctor. A random doctor comes in, barely able to get gloves on. They didn’t have time to get the bed apart or the “stage” lights on. That is how FAST she came. In less than 15 minutes, Maddy was here! From the time Jen got in the tub to the time she delivered was just under 15 minutes. Jen didn’t even push! Ten minutes after Maddy was born, Jen’s OB/GYN, Dr. Guzman, arrived. I can’t say enough nice things about this man. He truly cares about his patients and it shows! He stayed and visited with the newest arrival, crying tears of joy with them. He hugged them. He laughed with them. He cared and it showed. Next, the new big sisters came to meet their little sister. To say they were in love would be an understatement. Middle sister wouldn’t stop gently stroking Maddy’s head and kissing it. Adorable, right? People often ask me why I love birth photography. THIS story is a prime example as to why I do what I do. I am the fly on the wall. I am the artist who captures those moments that are often forgotten, the parts of the story that we overlook in the heat of the moment, the tender moments of encouragement showed by husband while his wife is in labor, the sweet gentle kisses of a new big sister, the embrace of a proud doctor. THAT is the reason why I do birth photography. Congratulations Gunty Family! I love you!! Baby Zoey came to see me a few weeks ago for her newborn session, she was such a precious little girl to photograph. I met her parents in a tiny little Starbucks a couple months before her arrival. We bonded over website designs and search engine optimization. These two made a website blog about all things Zoey! Isn't that amazing?! Not too many babies can say that they have a website about themselves. Check out Zoey's site here. When it came to Zoey's photo shoot she was already a pro in front of the camera. She was full of smiles and snuggles. During Zoey’s session, her momma shared with me that Zoey's grandma made Zoey a special hat and blanket just for this photo shoot. So that special prop was at the top of the list of priorities for Zoey's prop setup. Zoey had everyone wrapped around her little finger, especially her dad. Zoey slept the entire time and flew through her session. Her session was done in just under an hour and a half. Which is unheard of! Zoey was so sweet. I consider it a privilege to photograph each baby that comes to our doors. Thank you so much Malone Family; for trusting me in capturing these memories of your sweet baby girl. I was so blessed to capture these peaceful and tender moments for your family. I can’t wait to see Zoey grow! Before I go, one last fact about Zoey's session! In the family portrait above you can see that Mama has two rings on. One her wedding set and the other (on her pinkie) is a ring that they have set aside to give Zoey when she gets older! Isn't that amazing? Zoey will be able to look back at her newborn session and see that ring's presence years before she actually gets to wear it. Special sentimental details like this just warms my heart. This beautiful little girl came to see me a few Sundays ago. Her parents were given a gift certificate for a session with me! I love when I hear that loved ones want to give the gift of memories to their family. In my opinion, it is one of the best gifts to give. These are images that this family will have a lifetime. We turned on some worship music and had a lovely session together. Jae Lynn's creamy porcelain-like skin was to die for. And those chubby cheeks, I just wanted to snuggle her all day! Mom and Dad came camera ready. I love when parents want to be present in their newborn session. This is such a special time in life, and it is so important to be a part of it. Jae Lynn's momma was a natural in front of the camera. Jae Lynn was so relaxed and happy in her mama's arms. The way Jae Lynn's daddy looked at her melted my heart. You could tell that he was mesmerized by all of her little movements and sweet newborn sounds. Of course, since this sweet little girl was born in fall we had to do a fall set up. This little pumpkin was as cute as could be! I mean those lips, aren't they adorable?! The knot basket is one of my favorite props to use and Jae Lynn was perfect for it! After a couple different basket set ups, I brought Jae Lynn over for some simpler shots. Her soft skin and luscious rolls were the highlights of these poses. Jae Lynn is so beautifully dainty. I thoroughly enjoyed photographing this sweet little girl! I can't wait to see her again. Today I asked my sweet friend Keri (Avery and Ivan's Mom) to share a little insight on being a NICU parent. Although people often mean well and to encourage parents who are going through this kind of situation. Here are some things you shouldn't say. I mostly did a smile and nod, but these are some of the answers I wish I would have given. 1. "What did you do?" Moms who have their babies early are under a mountain of guilt. Many feel like failures because they did not carry the babies to term. Life happens. That question makes everything worse. 2. "Are they going to make it?" I try to think positively, but you never know! Thank you for reminding me. 3. "You don't even look like you had a baby!" Yes, not only am I walking around without my newborn twins, I don't even look like I just delivered them. Thank you again for the reminder. 4. "At least you can sleep while the boys are in the hospital!" No, definitely not. I spend most of my time camped out in NICU and/or chained to a breast pump eight hours a day. 5. "Your boys will come home and it will be like nothing ever happened." 6. "At least you didn't get to the third trimester and have to be uncomfortable." I promise you I would have stayed 41 weeks huge for two years if it meant my boys did not have to stay in the NICU. 7. "At least you had an easy labor." Oh, that's right. The terror I felt from one water breaking before 26 weeks combined with being in full labor for 40 hours before being allowed to push was super easy. 8. "It's like you have a free babysitter!" 9. "Oh! Your babies look like normal babies!" Really? Did you expect to see a disfigured reptile? 10. "I wouldn't be able to leave MY baby at the hospital overnight alone." Thank you, Keri, for guest blogging and sharing your photos! Check out the boys' newborn session to see how big they have grown! This sweet little miracles came to see me when they were 4 months old. After a three month NICU stay, it was an honor to be trusted with capturing these special moments for their parents, Keri and Chase. On February 21, 2016 these sweet little boys made their appearance into the world 14 weeks early. Ivan and Avery both weighed in at 1 pound 13 oz, despite being born early both boys surprised everyone by attempting to breathe on their own and crying. Avery even opened his eyes! Both boys would have a very long NICU journey ahead of them. But against all odds, the boys and their parents overcame complications, took down mountains and made it out of the land of uncertainty. They are all survivors. During their journey, mom Keri shared her feelings often. Talk about an eye opener. The words below were some that I had to ask to share. I have deliberately avoided writing down my feelings about this pregnancy and the NICU for 8 weeks now. I guess I naively thought that pushing those thoughts away would help me to power through it all. I was wrong. More accurately, there has been nothing in my twenty-five years of life that could have possibly prepared me for this. There are so many things I wish I could have known sooner. I wish I would have known that most days my hands are no longer recognizable from all of the hand washing. Or, that people would say things that are meant to be nice, but really just cut to the core of my reality. I wish I would have been warned about the number of tears I have and will shed. I needed to be told that it's okay to cry every time I leave my boys behind in the NICU. I also needed someone to tell me that it is equally okay to feel something that closely resembles dread every time I drive to the hospital. It's difficult to get excited about visiting and develop a truly deep connection when I only get to "care" for my children with permission and assistance from staff. I don't feel like a mom. I feel like an outsider. I wish I would have known about the intense feeling of helplessness that has manifested itself or that it would come and go during the most inconvenient of times. I never realized that I would need to be told I was doing enough. Loving my sons, enough. That I was bathing them right. Pumping correctly. Sitting at their side the right amount of time. Giving my husband encouragement. Updating my friends and family. And despite the compliments or reassuring smiles, it always seems to feel like we're treading the deep end. Some people compare the NICU to a rollercoaster. I call it the third ring of hell. What I've come to realize through 5 weeks in Antepartum, 3 weeks thus far in the NICU, and the endless visits with doctors, specialists, and therapists is to love. It's hard to do - that love thing - with all the beeping and coding. All the nurses running, charts clicking and specialists knocking. It's hard to see where you want to be when you look around and hardly know where you are. I really do try to find love in the smallest of things, however, I often find myself feeling sorry for us. It was on one of those days of feeling sorry for myself that I heard it. Every NICU parent knows that the quick feet of nurses running down the hallway and the hurried feet of the neonatologist are never good. For more than 20 minutes I listened to the frenzied activity. And then came the tears. A mom screamed, "NO." And I knew. The NICU fell silent save the beeps and alarms. So, during one of my pity parties a baby had died. And that just seemed like the unfairest of unfair things to happen to anyone. Ever. An hour later, our sweet red-eyed NICU nurses welcomed another emergency transport. Another miracle. Another life to save. And the hum of the NICU continued, but not without all of us there knowing the NICU never makes promises. The NICU club isn't for sissies, it's for fighters. I wish that I could promise the boys will be fine. I wish I could know with certainty that prematurity won't have lasting developmental effects or that I won't suffer from PTSD, but I can't. Every journey is different. Every baby, every hospital, every specialist, every outcome - they're all different. When I look in the mirror, I see a survivor who needs a hug and probably more concealer but I also see a heart full of gratitude. I'm going to keep trying to dream big. I'm going to order those adorable 2T shirts that I know won't be worn for months, possibly even years. I'm going to trust my instinct and love these babies with all I've got. I'm going to take each day one at a time because every day is a blessing. ~ Keri C.
Beautifully written Keri. Thank you for being so transparent, and for allowing me to share your transparency with readers. Keri and I both hope that this story shines a light on NICU journey's. While every NICU journey is different, each family deserves the same level of support. Set up a meal train, offer heartfelt encouragement and prayers, send cards filled with uplifting well wishes. But most importantly, lend an ear. Catching up on my 2016 Blogs and I decided to share this sweet girl's session tonight. This beautiful girl holds a special place in my heart. Her mom and I have been good friends since I was in middle school! We met as lifeguards for the City of Phoenix and have been friends since. I was thrilled when Aryas's mom asked me to photograph her sweet baby girl. She was such a wonderful baby to photograph! I decided to try a new backdrop color from my normal light neutral tons and chose a soft pink. I love this teddy bear bonnet! This beautiful girl holds a special place in my heart. Her mom and I have been good friends since I was in middle school! We met as lifeguards for the City of Phoenix and have been friends since. I was thrilled when Aryas's mom asked me to photograph her sweet baby girl. She was such a wonderful baby to photograph! I decided to try a new backdrop color from my normal light neutral tons and chose a soft pink. I love this teddy bear bonnet! This beautiful girl holds a special place in my heart. Her mom and I have been good friends since I was in middle school! We met as lifeguards for the City of Phoenix and have been friends since. I was thrilled when Aryas's mom asked me to photograph her sweet baby girl. She was such a wonderful baby to photograph! I decided to try a new backdrop color from my normal light neutral tons and chose a soft pink. I love this teddy bear bonnet! Aryas was the perfect little model! This baby girl was so squishy! Her chubby cheeks and loveable nature just made me want to snuggle her all day. I love photographing new families. Alisha and Jeff were adorable during Aryas's session. Seeing their love and excitement as they bond as new parents really made me happy. Aren't they cute?! Check out those chubby cheeks! I can't help myself I just want to kiss them every time I see this image. Maybe I'm a little biased but her features are perfect. That button nose and those little lashes. Aryas's was the perfect baby to use my knitted newborn romper from one of my favorite vendors, Devoted Knits. I had been hanging on to this piece for a while but couldn't ever find the baby that was the perfect size fit. Congratulations Alisha and Jeff! Love you! I'm spending time reminiscing tonight, as I get caught up on blogs. Tonight, I'm sharing with you one of my favorite sessions of all time. Every newborn session is a favorite, but this special girl and her daddies hold a special place in my heart. It is always a special time when I have a new family in my studio for their newborn session. I love seeing how these new and excited parents react to the cute poses and props. Or when they snap a couple behind the scene photos. And, occasionally you will hear an “awww” when the baby sneezes or grunts. This session was exactly like I described above but with a little bit more emotion. Her daddies waited a very long time to meet her. Normally it takes a baby 9 months arrive. It was at least a two-year process before Louise was born. That’s a long time to wait! But good things come to those who wait. Louise came to see me at 6 days new with her two daddies that came all they way from Europe to see her born. Louise’s surrogate momma was also in the studio for her session. This was such a joyous occasion! And it was amazing to be part of it. The friendship that has developed between her surrogate mom, Trista and her two dads is inspirational and heart warming. When I met with her daddies before she was born we talked about her nursery which is cream and pale pink. I wanted to integrate those colors in her session so it would match perfectly with her nursery! Her daddies also brought a bonnet that Louise’s great grandma had knitted for her. The bonnet was one of the most beautiful bonnets I had ever seen. And to know it was made with love especially for Louise filled my heart with joy. Fun Fact: I am happy to say that this was the second time I was able to spend time with Louise and her daddies. I was blessed to be there to witness sweet Baby Louise being born. Isn’t that amazing?! This is why I love what I do! Want to read her birth story? Click HERE. I LOVE when families come back to visit me for their newborn sessions! Congratulations to Baby Louise and her two daddies! I hope that I am able to see her grow even though we are far away. I had the sweetest six-month session with this beautiful little girl. It went much different than her newborn session. When I saw Gia for her newborn session she was already six weeks old. Even though the recommended newborn age is six to fourteen days old. I love a challenge and took on Baby Gia. To this day, she is still my longest newborn session at a whopping five whole hours. And she was not crying folks! We just had to have lots of snuggles to get her calm and content. Gia's six-month session was a whole different story. Not only was it only an hour long but she was full of smiles. Her dad was also relieved to see that studio did actually have A/C! Because the room is kept warm for newborns, he was expecting a warmer and longer session! I think I made his day when I announced that the session was over at the hour mark. Because Gia was so easy spirited we were able to do several outfit changes. Is this cream tutu not the cutest thing you have ever seen?! Something I learned about Gia is not only is she a beautiful baby but she is a beautiful rainbow baby. Her mama had saw Brinlee's rainbow baby photo from her newborn session and asked if we could somehow incorporate the beautiful pastel rainbow wrap. Obviously Gia is too big to swaddle so I used it as a textured layer instead. This is one of my favorite set of pictures! Something I love to do at milestone sessions is to put the baby in a prop we used at their newborn session. At six weeks old I laid Gia in this beautiful white washed basket. At six months Gia sat up in this basket! Gia is one of the cutest babies I have ever seen. I can't wait to see her for her cake smash! I can not get enough of this sweet little girl. I was tickled to be included in her birth story. But now I'm even more tickled to be a part of her first year. I chuckled to myself when I thought that it wasn’t truly Brinlee’s inaugural time in the studio. Of course, during the first photo shoot, she was in utero! I was lucky enough to take Michelle’s pregnancy photos when she announced she was expecting. She dressed in a rainbow to signify she was carrying a rainbow baby. I also had the amazing opportunity to photograph Michelle's gorgeous belly again at a beautiful outdoor maternity session. So naturally, when baby Brinlee arrived for her newborn photos, we continued the theme. This delicate little princess was such a great model. She slept so soundly nearly the entire session. I was hoping to see her beautiful eyes but we’ll just have to wait for her to be older! I wanted to incorporate lots of different rainbow set ups into our photo shoot. Brinlee’s a miracle babe and deserves a magical welcome. What is more magical than a gorgeous area of colors that magically appear in the sky after a storm?! I dressed the sweetie in rainbow bloomers. I also wrapped her up in a rainbow-colored blanket and placed a dainty rainbow headband on her head. Using the blanket as a starting point, I arranged some beautiful butterflies along the edge, since they can signify hope, new beginnings, and transcendence; a perfect metaphor for this moment. Some of the most tender moments I saw through my lens were between Michelle and Brinlee as mom held her daughter, who was wrapped in a rainbow. I also couldn’t wait to use different girly scenarios with baby Brinlee. I spent a lot of time surrounding her with just the right amount of lavender, before placing her in an adorable wheelbarrow. I took some pictures with Brinlee wearing a custom-made hydrangea headband, and others with her donning a flower-adorned hat while curled up in a garden basket. And not to outdo the aforementioned cuteness, I also added a pearl headband and a little bunny to the photo session. This baby is such a beautiful little girl. She certainly takes after her mama. Babies like Jameson make me excited to go to work in my studio every day. Not only is he totally delicious, but this perfect little cherub also stayed in dreamland the entire photo shoot. This allowed me to work my magic nonstop. And as a result, I was able to stage several different set ups. Squee!!! Of course, I always love to take the pictures of mom and dad with their little miracle. I will seriously never tire of watching the way parents look at each other and at their baby. It’s truly the purest form of love and I am honored to be able to capture that for posterity. Jameson’s mom and dad dressed in white for their first family portraits. Mama is a nurse and Dad works in finance. But don’t let that fool you! Both of them have a wilder side too. They absolutely love Harley Davidson Motorcycles. In fact, their super cool engagement pictures were taken while they were riding their bikes. If only they made baby motorcycles, am I right?!?! And I couldn’t resist photographing their sweetie with their wedding rings too. But I also took pictures of the softer side of baby Jameson. Since he remained sleeping, I got to pull out all the stops. Mom and Dad brought along an adorable costume change for him as well: a hat with his name printed all over it! I was kind of obsessed with the hat, actually. Especially after I learned that this is how Jameson's Mom and Dad announced to their family what his name was! What a cool way to announce a little one's name. Congratulations M Family! Jameson is perfect! I have had a lot of people ask me who the proceeds of the holiday minis are going to this year. Please read this wonderful family's story. Chris and Shelle Harman are the parents of five beautiful children, only two of whom are still living. Married just 11 years they have lived their vows to love in sickness and health more times over than any couple should have to withstand. They lost their first three children to a neuromuscular disorder called Spinal Muscular Atrophy (SMA). Their eldest son, Logan, lived to be just four years old. Logan's journey with SMA started Shelle and Chris on their path of advocacy for proper care for their children and others who cannot speak for themselves. 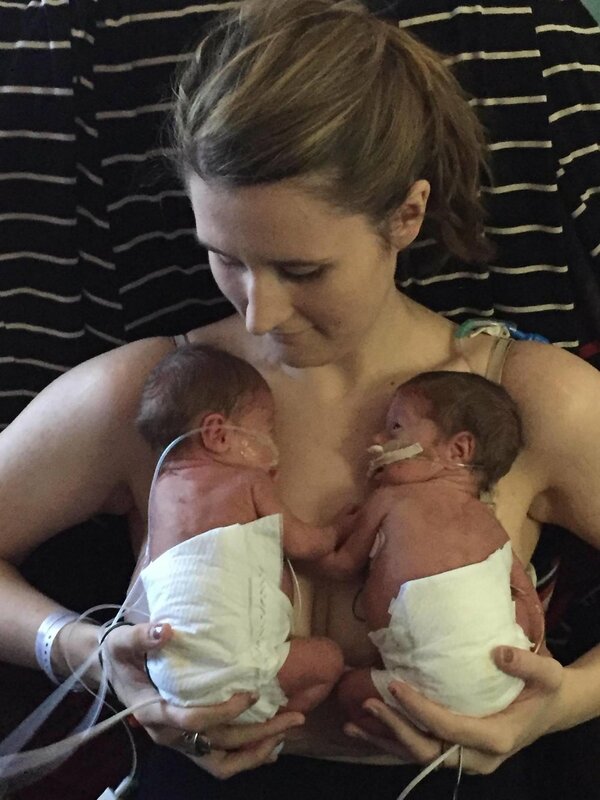 Since the loss of Logan and their twin daughters, Kali & Mikayla , who also had SMA, they have been blessed with the births of two more seemingly healthy sons. Jase is their fourth child and is four years old. Jase is a fantastic big brother to Braxton their fifth (and final) child. Braxton Christopher was born Saturday, February 1st, 2014. Weighing in at 6lbs 9oz, he was a strong little nugget of love and joy. The first 6 months of his life were fairly typical and Braxton seemed to be doing well. At the time of his birth big brother Jase was ruler of the roost and took up a lot of Shelle and Chris' time with multiple ear infections and other delays because of them. At his 6 month check up Shelle mentioned that Braxton seemed to have troubles with feeding. Having experienced a very similar path with Logan, they were, understandably, terrified when Braxton's pediatrician suggested that they have a swallow study done. The feeling of déjà vu was further amplified when the swallow study revealed Shelle's greatest fear; exactly like Logan, Braxton was aspirating (a portion of everything that he swallowed was ending up in his lungs rather than his stomach). Fortunately that is where the Logan and Braxton déjà vu diverge. Braxton was able to continue eating in spite of the aspiration because when the liquids were thickened he was able to keep them going into his stomach better. Unfortunately, after less than a month of thickened liquids he began aspirating those too. At this point even soft and solid foods were difficult for him to eat which made it difficult to maintain his weight, let alone gain any. Braxton's aspiration was leading to issues with breathing (liquids and food can damage lung tissue if it occurs often or for too long) and his weight was continuing to be a problem he underwent a "triple scope" to see if the doctors could find out why he was aspirating. The triple scope allowed a pulmonologist (lung doctor), gastroenterologist (doctor who focuses on the stomach and intestines all things digestive), and an ENT (ear, nose, and throat doctor) to all get a look at the interior of the areas in question with a small camera (sometimes referred to as a scope) inserted into his body through his nose. The procedure was done under anesthesia so it was painless but the results were far from what Shelle and Chris were expecting. The reason for Braxton's issues stemmed from a cleft larynx. In simple terms there is a hole in his esophagus that directly leads to his trachea that was supposed to close a birth and didn't. Over the next few months their lives were once again turned upside down as it was determined that hole would likely require surgery to close it but due to his malnutrition and small size the repair could not be done until he was at least three years old. In the meantime it was decided that a feeding tube would be the best option to insure that Braxton was able to get much needed nutrition without risking aspiration. The surgery to place the g-tube (tube placed into the stomach surgically) was successful at first and seemed to be a route to getting him back to the healthy and strong baby he was at birth. The success was again short lived as the surgery to place the g-tube began Braxton on a still unresolved journey with chronic severe pain. In addition to the extreme pain Braxton has endured numerous infections, slow to crawl, very weak muscles in his core, abscesses, difficulty healing, reoccurring cellulitis (infection of his cells; he has had this eleven times in just one year), several procedures to clear out the infections inside his abdomen; in short more than any two year old should ever have to experience. All of these problems have left not only Shelle and Chris with questions but even the physicians are unable to explain why this is happening. The original problem with the cleft larynx was manageable as was the need for a feeding tube but the resulting pain and infections have not been easy to handle, on a variety of levels. Due to the extreme nature of Braxton's yet to be controlled pain, he has slept very little over more than half of his life. In the past year and a half he has managed to survive on less than three hours of consecutive sleep and generally three hours total is a good night. His pain has yet to be controlled and there are a multitude of possible causes but none have been identified and substantiated. He is on narcotic pain medication and has been for over a year and a half. It is losing its effectiveness. In recent weeks it has been determined by the genetics and neurology teams that Braxton should undergo testing in hopes of being able to find a diagnosis that incorporates all of his variety of ailments. The testing is referred to as Whole Exome Sequencing. The blood test would allow for a good look at all of his DNA and any possible abnormalities that could explain at least some if not all of what is currently ailing Braxton. They are still waiting on results because the first test was done incorrectly. More than anything Shelle and Chris want answers and solutions to allow their baby boy to live a happy life without constant pain and infections. With answers for Braxton he could get a possible treatment, specialists that treat the disorder and give Braxton a better life without or less pain. They are being referred to specialist in Southern California who are very interested in helping find what's going on with Braxton. This is going to be very costly for Chris, Shelle, Braxton and Jase. This amazing family are friends of mine. I will be hosting multiple stylized session days at different locations. Prices will vary from $100 to $250 depending on location and what is included. ALL proceeds earned will be going to The Harman family to support them in their travel to California to help them get Braxton the medical care he needs. Please spread the word! Your support is appreciated! There is currently a contest being held for two mini session give-a-ways because I do need some models for marketing materials. Click here to visit the facebook page and enter to win! The winner will be randomly selected and will be announced by 9pm MST! I always love it when you find out that your friend is pregnant. I love it even more when friends let you create a unique way for them to capture their baby's gender reveal. I met Sarah and Tim almost two years ago when Zachary was born. (Check out his birth session here) This little Irish boy was born on St. Patty's Day! I can't express how much I love this family. Over the years we have become close friends. Our friendship really grew when our husbands connected over their love for homebrewing and craft beer. Which led me to brew the crazy gender reveal idea. With the help from Freak'N Brewing Company, we were able to pull off an amazing way to announce this little one's gender. I can't wait to meet this sweet little bub in March. His due date is the day before his big brothers birthday! How cool is that? Mom and Dad have decided to do birth and newborn photography just like they did for Zachary. Not only am I able to witness this new little guy come into the world, but I was able to witness his big brother come into the world. That's a pretty spectacular thing to be able to say. This is one of the reasons why I love what I do. Congratulations Meier Family! I'm over the moon excited for you! Can't wait to capture these new moments for you. Every baby is a fabulous mix of their parents. So I was thrilled to photograph sweet baby Brielle with props that truly show where and who she comes from. Both her mom and dad are originally from Washington State. They learned about my studio through Glendale-based OBGYN Dr. Desiree Brotsky. I am honored that I’ve had the opportunity to work with many of Dr. Brotsky’s patients and their little ones. Working with Brielle’s family was so much fun. This little angel’s Mommy was a photographer in the Evergreen State. She brought along an amazing prop from her old studio to our shoot. Positioning Brielle under a sleeping moon was so easy. That baby was out like a light! She looked so peaceful…as though she were in a story book. Brielle’s Daddy is a chef and wanted to bring his love of cooking to the shoot. We had a great time arranging the set to reflect his culinary passions. We used Dad’s first set of cooking instruments and a mixing bowl. And seriously, there is nothing cuter than a baby in a bowl surrounded by ingredients. It’s artistic and delicious! Another key part of our photoshoot also had to do with Dad. He is of Native American heritage and chose to include a pink chief blanket in the pictures. It was so special to photograph Brielle while paying homage to part of her lineage. This photoshoot was a bit of a departure from The Baby Whisperer studio’s traditional look. I tend not to gravitate toward bright colors, but including them in this set up was extremely important and I believed it warranted an exception. Of course, I still got to include my favorite elements! Congrats again Mom and Dad! It was a pleasure to photograph you! Mom and Dad are big fans of the Harry Potter series and decorated Leo’s nursery for this adorable little wizard accordingly. Of course, it was only fitting that we incorporated the magic of that into his newborn photo session. This was such a fun photo shoot to plan. I had a vision of doing the potato sack pose along with him “sitting” by himself wrapped in his Hogwart’s scarf with a little wand and glasses. It’s amazing to see it come to life! Something that deserves special mention: Leo’s luscious blond locks. Most newborns don’t have the fabulous head of hair that this little boy is sporting. And special mention must go to his rolls! The chubbiness is delish! Little Leo you put a spell on me! I can’t wait to see you for your six month session! I remember sitting in my car and having a feeling that I needed to text the mom I was on call for and see how she was doing. I had been on call for her birth now for two weeks. Her due date was approaching. I literally could not get her out of my mind. I sent her a text only to find out that, mom was in labor! Talk about a God thing, right? I was excited for this photoshoot because I knew it would be more than taking pictures of a beautiful newborn: I would be documenting mom and dad’s journey to becoming parents. Not only would I be documenting their journey into parenthood. But I would also be documenting the moment that they found out the gender of their baby! I love photographing newborns. But birth stories tug at my heart strings. To be able to capture this memory for parents, is always an honor. Mom and Dad booked me before mom was even out of her first trimester! She had found me on Instagram and had been following me since. I was over the moon excited for them. I truly felt that not only had I gained another set of amazing clients but I had also gained new friends. It was such an honor to capture these intimate photos and videos. They will forever be reminders of the day their precious baby had blessed the world with their presence. I met the parents-to-be at Babymoon Inn, a birth center in Phoenix. At this birth center mom could have a natural water birth. She was tended to by the Babymoon Inn Midwives, who did a fabulous job keeping her calm and focused on the end goal of baby. Dad was extremely supportive throughout the birthing process. He doted on momma and was so attentive to her needs. Grandma and Grandpa drove all the way from New Mexico to witness the birth. I love how supportive grandma was to Mom! It was amazing to witness this family come together to bring this sweet babe into the world. Mom was so inspiring. She breathed through each contraction like a pro. Even though I was there to observe, she was so focused that at times I felt like I was simply a fly on the wall. The moments of pain and then relaxation came and went and I managed to snap pictures of it all. When it was finally time to push, I realized I had forgotten my tripod. But our amazing nurse offered to shoot a video to help document the baby's surprise gender reveal. I would not have been able to capture that on video without her help! They say ‘a picture’s worth a thousand words’, I felt that capturing the miracle of life at the moment it’s happening definitely warranted video. Especially when Mom and Dad were going to be the one's announcing what gender their precious baby was. What an amazing moment to capture! In what felt like a flash, the baby had emerged from the water. Mom and Dad were elated. Actually all of us in the room were pretty overcome with emotion. A moment after soaking in their fresh new baby they decided to find out baby's gender. It's a girl!! Savannah Grace was born in the wee hours of the morning. It was such a special day for the Carlin family and I feel honored to have been able to observe it all. Congratulations once again Carlin Family! Welcome to Parenthood! July 14th was a perfect day to have a baby. Michelle had been waiting for this little one’s arrival for a lifetime. The staff at Honor Health Scottsdale Shea was amazing. They were warm and encouraging to not only Michelle but her support team. Baby Brinlee was born via c-section and I was right there with my camera documenting the whole amazing birth. Brinlee Makenna made her appearance at 9:48am. I marveled at how the sweet little baby was only a minute old when she reached her left hand into the air as if she was waving to the world, announcing her arrival. I took a moment to focus on Michelle's face as she gazed upon her rainbow baby for the first time. I watched as a smile grew from ear to ear and a look of calm washed over her. A rainbow baby, in case you’re unfamiliar with the phrase, is one born to a mother who’s had a prior loss. You can think of the baby as the rainbow after the storm. In case you missed it, here is Michelle's Journey and Rainbow Baby Announcement. Michelle's sister was there for every wonderful, miraculous moment. From sharing the joy and excitement of Brinlee's arrival to making sure her new niece’s adorable little hat was perched perfectly on her little head. She held all 7 pounds and 14 ounces of baby Brinlee as mama was being sewn up. Even though Michelle was unable to sit truly pose for the camera, the candid moment in the operating room between her sister and her with Brinlee was so moving. And still is one of my favorite set of photos. Very soon, Brinlee was wheeled into the recovery room. And finally had an official meeting with her mama. Michelle held her baby so tightly. She had been waiting for that moment forever. She just stared at her baby daughter’s facewith such love in her eyes. After just over an hour in the recovery room we all headed towards postpartum. A moment that tugged on my heart strings: When Michelle held her baby she got to ring the lullabye. This is the lullabye lets everyone in the hospital know that a baby was born. I will never forget the look on Michelle's face when she got to ring that bell. I will say it was hard photographing when your eyes are blurred with tears! Congrats again Michelle! Brinlee is so beautiful and I am over the moon happy for you!